Ecuador's Red Cross honors Israeli ambassador, MDA organization, citing assistance in building up Red Cross program. The Higher Technological Institute of the Ecuadorian Red Cross (ISTCRE) marked its 14th anniversary. In the ceremony, the Israeli Ambassador in Quito, Mr. Edwin Yabo and Israel’s Magen David Adom emergency first responder organization received awards of appreciation for the ongoing support of the Institute's activities. "The cooperation between the two countries allows us to share the unique knowledge acquired in Israel with our partners in the world, for the important mission of saving lives and in order to present the true face of Israel to the world,” said MDA Director General Eli Bin. 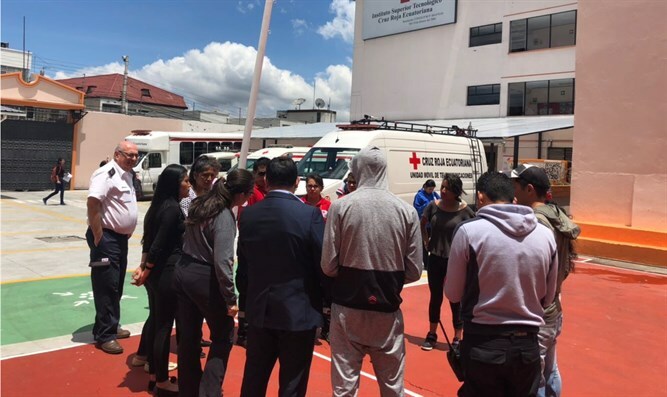 In honor of Magen David Adom's cooperation with Ecuadorian Red Cross, Magen David Adom was awarded a Shield of Appreciation for its support of the Institute's activities. Magen David Adom (assisted by the Ministry of Foreign Affairs center for international cooperation - MASHAV) provides assistance to the Paramedic Training Institute in building capacities for training and organizing mass casualty incidents and advanced Paramedic training programs. MDA instructors and senior members of the organization participated in, and guided workshops in the country, organized a large mass casualty incident drill together with local Red Cross personnel and the Institute. In addition, the organization's senior staff visited MDA, participated in MDA Paramedic training programs and joined MDA crews on Mobile Intensive Care Units. The organization received special recognition from the Institute for these activities. "Magen David Adom assisted the academic activities of the Higher Technological Institute of the Ecuadorian Red Cross by bringing professional knowledge to the Institute's workshops and courses,” Director of Regional Reference Center for Medical Emergencies and Pre-Hospital Care (CREMYAP) Mr. Edwin Davila said at the event.